With the rpi there’s the choice between using either UART or SPI. If UART is used follow the linux-specific steps. The following steps yields a rpi that can interface with the firmware on the Nucleo F401RE via SPI. The rpi and the STM32F401 must be connected as explained here. The CLI uses the pigpio library and therefore requires root priviledges (sudo). At the time of writing the graphical user interface only works with firmware released prior to december 2017. Unzip, enter directory, and type ‘make’. The resulting executable should look something like this. Not all features have been implemented yet, but you can set the integration time and collect data (record). The Otter Raman GUI. 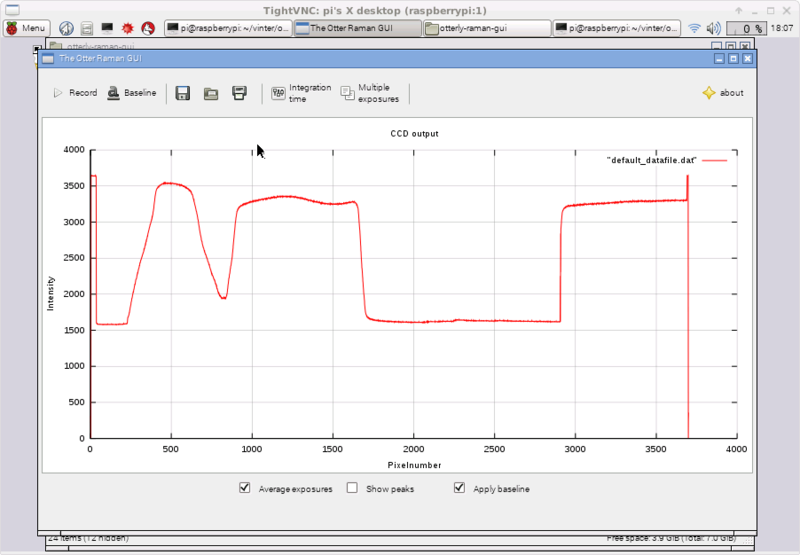 The rpi was accessed remotely through VNC. The data is saved in the “default_datafile.dat” and plotted with gnuplot in the file “default4_plot.svg”. Both files are overwritten each time Record is pressed. For a more feature-rich version of the GUI have a look at the work of Jens-Ulrich Fröhlich’s blog Leaves of science or his github project-page.